Whether or not you’ve been around for the past several decades, if guitars are your thing you probably know about MXR. This company used to make some of the best guitar effects pedals on the market and is no longer with us in its original form. Instead, Jim Dunlop took over and started reissuing some of MXR’s best models, and boy there are many. The MXR Phase 90 is among the oldest and most iconic effects of this type that are still being used today. By all metrics, the newly built ones are every bit as good as the original MXR produced units. Today we are going to take a closer look at one of the new Dunlop MXR Phase 90 phasers. One of the most respectable things about Dunlop is the fact that they kept the design of the MXR’s pedals intact. Some other companies would feel compelled to add their own flavor, and thus completely ruining the source model in most cases. Dunlop took the high road and delivered the good old Phase 90 in its original form. That means orange box and a single knob to get you started. This is an analog model, so it’s a lot more attractive to those who are looking for softness and something more natural. MXR’s very first commercially successful phaser packed a single control knob. That knob controls the speed or better said, the frequency of the phaser effect. For the most part, that was perfectly enough back in the day. 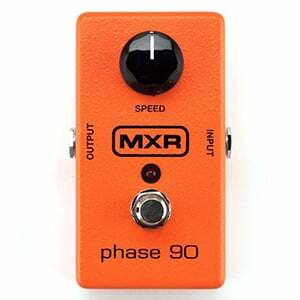 Some guitar players love the simplicity and like to use MXR Phase 90 specifically because of it. On the other hand, more modern players will find the lack of controls to be annoying at the least. It’s definitely one of those things that depend on the type of music you play and your overall taste. The performance aspect of the MXR Phase 90 is one of the main reasons why people keep coming back to this already archaic analog phaser pedal. MXR’s block logo circuitry is not that complicated, but it is hard to replicate. The fact that Dunlop has managed to do this so well is pretty impressive by itself. For the most part, the tone you get is very natural and organic. The effect flows with a certain dose of character, which is something more modern phaser pedals simply lack. If we had to determine one genre of music for which the MXR Phase 90 is suitable for, it would definitely be rock or blues. Metal is where more clinical and versatile phasers are much more helpful. At the end of the day, MXR Phase 90 is among the most popular phasers on the market at the moment. It’s very simple design is countered by its impressive performance which has kept guitar players from all over the world coming back to it for decades. With that said, it’s not the type of pedal everyone will love. It’s one of those cases where you either find it to be impressive, or simply useless. Rarely is there a middle ground with the MXR Phase 90. 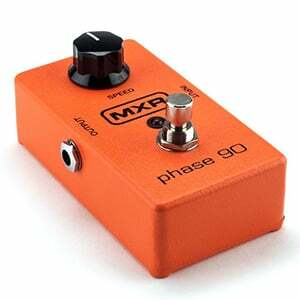 For more info about the MXR Phase 90, click here. For more Phaser Pedal Currently On The Market, click here.